The tomato plants had to be covered a couple of times since being planted in February to protect from possible frosts, but they’ve shot up and have blooms and at least one small tomato. They share the small space with turnips, radishes, lettuce, beets, onions and carrots. Yesterday the calendar marked spring’s first official day. Despite longer periods of cold weather throughout the winter months than is usually experienced here in northwest Harris County, evidence of spring is busting out everywhere in the yard. The big oak tree that shades the house in the summer is dirtying up the patio with its series of nasty droppings of “really-I-don’t-know-what” along with last year’s leaves that were still trying to hand on after a couple of late frosts. Recent rains with a few days of sunshine have perked up the grass and all of the plants already growing and others are piping up throughout the ground. Sun-kissed day lilies add a spot of early color to the yard. 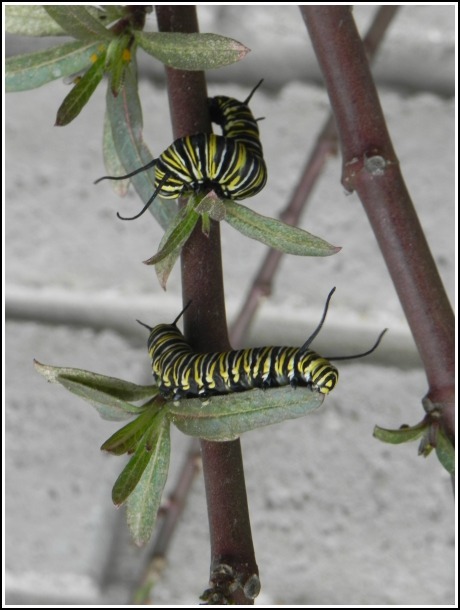 The milkweed plants in the sunny south flour bed made it through the cold days, but now their leaves are being devoured by a hoard of monarch caterpillars. 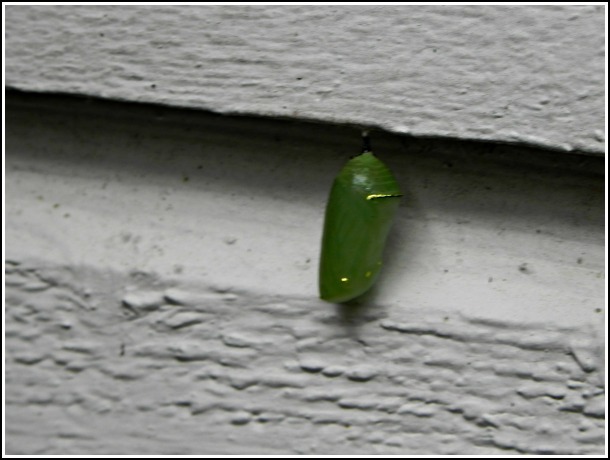 One of the caterpillars has already made its cocoon on the side of the garage. Planted on February 9th, these small tomato plants have a long way to go before they begin producing, but they seem happy to be in the ground and out of their small containers. 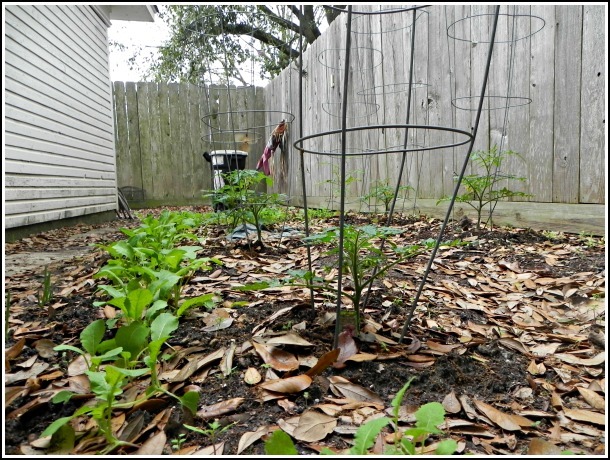 This is my sixth year of living in my house, and one of the reasons that I wanted a home with a yard was to have a vegetable garden. The overall yard space isn’t so large here, but I’ve made a space behind the garage for a small plot, and every year I’ve planted tomatoes and some other veggies. 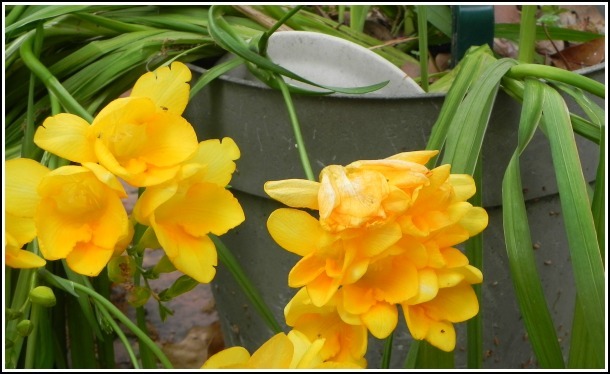 I had thought about not putting in a garden this year and had delayed tilling up the plot. However, one day this past week, I had some extra time and decided to get out the tiller, spread the compost that had been brewing, and dug up the garden space. I hadn’t really planned to plant anything that day, but with the sun so warm I dredged a few rows and dropped in carrot and beet seeds. Later, I went to Lowe’s in search of some other items, but wouldn’t you know it, out in front wwe racks of vegetable plants, and I couldn’t resist looking at the tomato plants. I ended up getting seven: a grape tomato that wouldn’t stop producing last year, three hybrids, and three Purple Cherokees, which are one of the tastiest tomatoes. I don’t always get good results from the heirloom tomatoes, but if they produce, they are worth the effort. 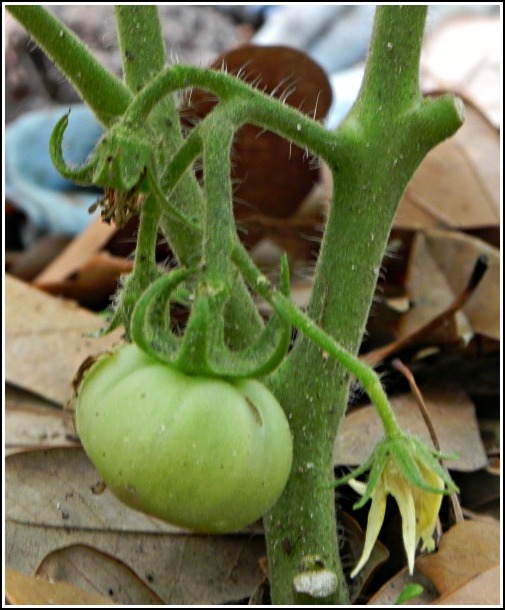 Here’s hoping this small Purple Cherokee tomato plant will produce some tasty fruit in a few months. I also got turnip and radish seeds, and even though, the sun was starting to set, I got the tomato plants set into the ground, putting bone meal and manure down into the holes first. 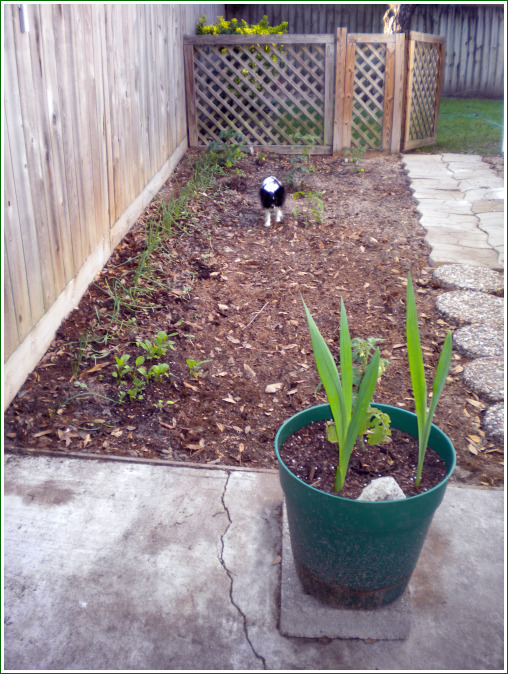 There was still enough room in the little garden, so I added several rows of turnips and one of radishes. February is a good time here to put in the root vegetables, but many think it’s too early for tomatoes. I’ll take my chances by putting them in early. Once it gets hot here, the tomatoes may bloom, but they stop bearing. If, by chance, the weatherman predicts a late frost, I’ll cover up the tomato plants. We’ve had a few nights below 32, but those temps haven’t done much to the flower beds or potted plants. Anyway, having the photos here makes a way to keep a record and we’ll see how the garden grows! This little dab of beans came from tonight's first picking. A couple of sad radishes came along for the ride. The rain these last couple of days has helped all the plants in my little kitchen garden, those in the pots and beds, and, more than any others, the grass. British Petroleum: They’ve promoted the brand BP rather than British Petroleum for a long time here in Houston. On billboards and in other advertising, they’ve seemed to want to hide their real identity and appear to the consumer to be an American company. After the explosion at their Texas City plant, British Petroleum came across as a denier, just like now with the gulf well, not wanting to own up to all the safety problems. That British Petroleum is directly involved in another major catastrophe is not a big surprise. Don’t Ask, Don’t Tell: A lot of promises were made by candidate Obama, and he and the Democrats got a lot of both verbal and monetary support because of those promises. DADT has almost 80% support from the American public, yet this administration is hemming and hawing about getting this dinosaur repealed. I know that gay people are not the only ones that are disappointed after electing a president and a congress that supported him. Health care reform is another example. The sad thing is this administration with the majority in Congress has the opportunity to make some much needed changes, but for quite awhile now they’ve all just looked like woosies. This rough patch that was probably a dog run before is starting to look like a garden! I don't know if old smells still linger, but Annie likes the garden as much as I do. This morning I spent the good part of another vacation day gardening. Actually, about four hours straight after getting up with Annie. I finished moving pavers, then dug up the rest of my garden plot, raked in some bags of soil, and finally planted the space to every inch of its life. 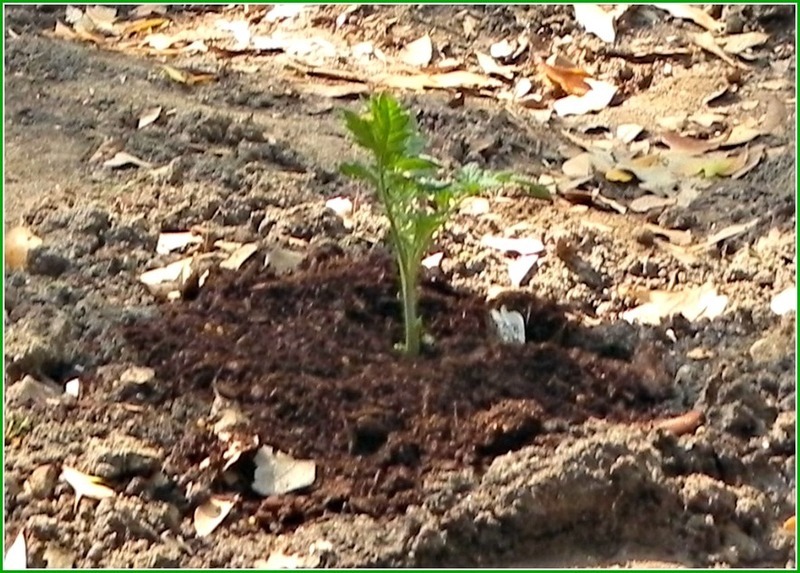 Yesterday I bought one more tomato plant–some kind of heirloom–two containers of okra sprouts, and several packets of beans and flower seeds. This morning I set in the plants and planted both green and yellow beans. I added some of the flower seeds in with the veggies, but most I put in the remaining space in my side flower bed. If everything grows well, then I’ve over-planted, but I’m not sure of anything because the space crowded in behind my garage and the back fence doesn’t have the best of soil. Gardening itself has to be food for the soul. There’s plenty of time to think while the hands are busy. Although it’s been many years since I’ve had a vegetable garden, there’s no question about how to do it. How deep to plant the different seeds, how to make the little trenches in which to plant the beans, it’s all second nature to me. What’s amazing is how much pleasure I get out of it. I had to laugh at myself, enjoying my time in the garden today, compared with the drudgery I had felt as a kid hoeing a row of potatoes. In some ways, I feel like this little garden has almost taken me full circle, back to the days of growing up on the farm, when I learned all the tasks involved with taking care of a garden, but not liking them all that much, and here I am now, getting so much enjoyment doing what I learned as a kid. Part of my garden looks good already; onions are growing despite being so close to the fence. 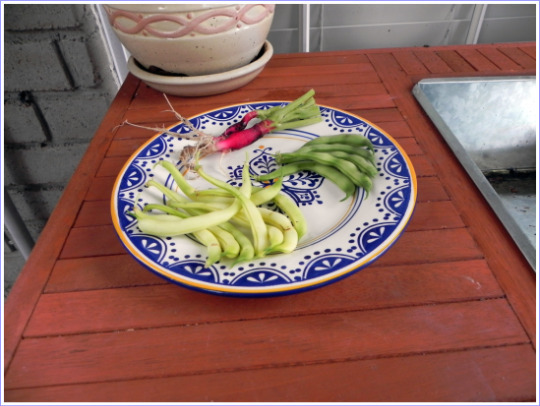 Some of the radishes look like it won’t be long before I can pull a couple, and the two sunflowers are stretching and straightening, trying to get more acquainted with their namesake. Everything else is moving at a bit slower pace, but I hardly give them much chance, checking at least twice a day, and more now that I’m on vacation. I realized, though, that everything has grown quite a bit when I compare how my garden looks today with just three weeks ago (see the photo further down the page).